Liferea, a free RSS feed reader and news aggregator, gets a new release. PPA has been updated with the latest packages, available for Ubuntu 14.10 Utopic, Ubuntu 14.04 and Ubuntu 12.04. 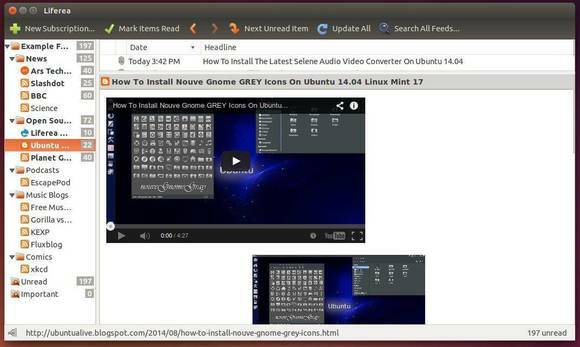 Liferea, stands for Linux Feed Reader, is a native app for Linux desktop. Its GUI is similar to a desktop mail/newsclient, with an embedded graphical browser. It’s able to play audio & video feeds with plugins. Liferea is available in Ubuntu Software Center by default, but it’s always old. 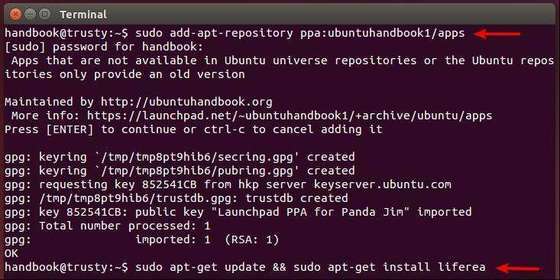 I have create a Ubuntu PPA and keep uploading the latest packages for all current support Ubuntu releases. The above will add the PPA repository and install the latest liferea packages in your system. Once installed, open the feed reader from Unity dash or application menu and enjoy! Just a warning, this disabled notifications and badges on the unity bar.